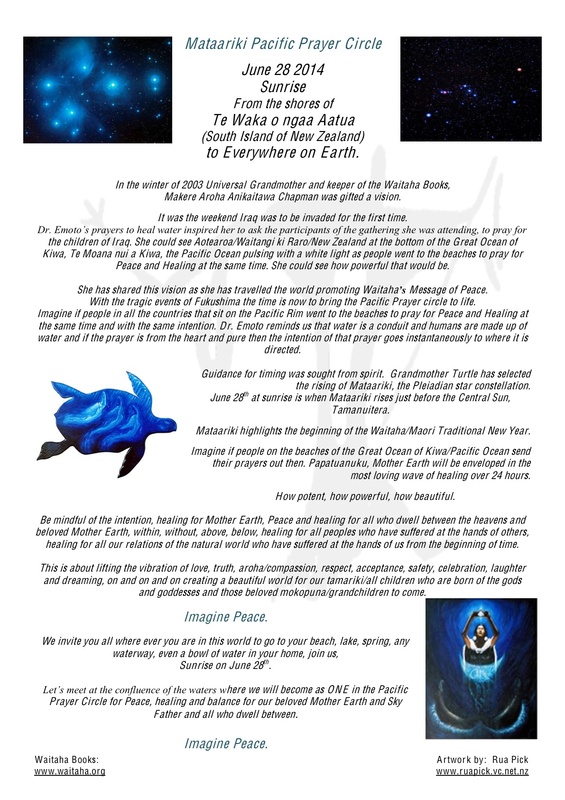 The invitation below came to me a few days ago from some beautiful souls in New Zealand who are holding a ‘Pacific Rim’ meditation/prayer circle at sunrise on the 28th of June. The intention to bring peace, harmony, balance and healing to the waters of the Pacific Ocean can be joined by all people living around the Pacific rim, and indeed everyone on Mother Earth. Thank you to Grandmother Makere Chapman for this vision of deep love and peace for Gaia and all beings travelling with her. This entry was posted in Ascension, Dimensions, Gaia, Mythology, Pleiadians, Uncategorized and tagged Dr Emoto, Grandmother Makere Chapman, meditation, memory of water, Pacific Rim, Peace prayer, Pleiades, prayer circle by Joanna. Bookmark the permalink.